A little over two months ago, I provided my initial observations from life with Tesla Autopilot. Clearly, I was young and foolish. Without a doubt, I rushed in. That said, I have no regrets and stand by what I wrote on June 25. One week after that first article, I wrote another article to highlight where Autopilot truly shines after a trip to Berlin in which it took my heart away. For sure, my eyes were full of stars and I was still giddy with excitement about the new wonders Autopilot brought to my life*. Again, I still completely stand by my comments about Autopilot’s superb performance on long, empty highways and in stop & go traffic. However, there are other scenarios where I’ve also learned to love Autopilot … as well as dangerous scenarios where I’ve learned it’s best to take over the wheel quickly. 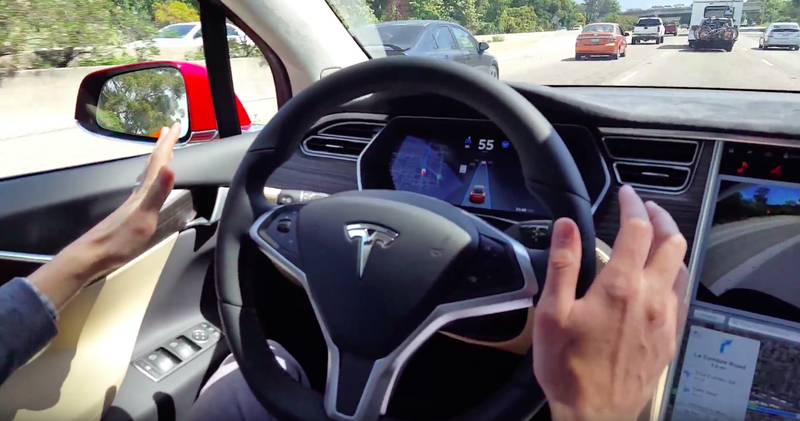 → Supposedly, Autopilot is not yet made for city driving, but holy hell does it work well there! 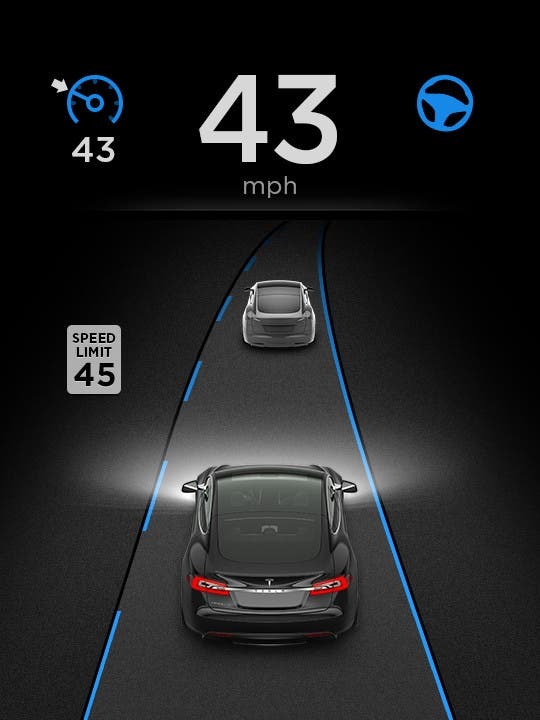 Staying within lane markings in busy city traffic, Autopilot is a freakin’ pro. So smooth. So reliable. And it’s so easy to watch it do its magic. → When trailing another car, the adaptive cruise control is superb, and having the ability to set the trailing distance to 7 different levels (distances) really lets you find the option that’s most comfortable for you. → Yes, having the option to turn on Autopilot on good routes in order to type something into the navigation or look at where you’re going on the map is quite a luxury. The same goes for when I want to search Spotify for something, change one of the car’s deeper settings, check for something inside the slick EVANNEX center console we have under the dash, take a drink, or turn on an Easter egg for passengers — still one of my favorite things to do. → Simply using Autopilot to drive more safely in normal driving conditions is a win. You don’t have to use Autopilot in a relaxed way all the time. You can put your hands on the wheel as if you’re driving, keep your foot on the pedal like you’re ready for a drag race, and focus intently on the route while the wheel turns and the car accelerates and decelerates. It’s actually quite fun — like a video game. ← The car sometimes drives far too fast on Autopilot. It doesn’t really pay attention to an approaching roundabout, sharp curve, or weird zig zags in the road if there isn’t really good signage — like, better signage than I’ve ever experienced in such cases. More or less, when approaching such places, you better be ready to take over the wheel and reduce the speed. ← To be honest, I’m not actually sure how well Autopilot handles roundabouts since the car is almost always going too fast into them and I have to take over. Or, on the rare occasions where I’m entering the roundabout at a slow speed, I get too nervous as I roll into it and decide I will take over before I see how well Autopilot can handle the situation. If someone here has actually gone through a roundabout with Autopilot on, I’d love to hear your experience. ← The car is awesome when the lane markings are good. When they are too faint or non-existent, Autopilot won’t even turn on. When the lane markings disappear all of a sudden, you can be in real trouble. There are a few places I’ve been driving where the lane markings disappear just as the road is turning. Autopilot, in such situations, wants to keep going straight. No, no, no, no, no — not a good idea. Luckily, in all such cases, I was attentive and quickly turned the wheel to keep the car in the lane. ← Roadwork is a challenge. This is really an extension of the above item, but it’s worth pulling out as a separate item anyway. In places where there’s roadwork going on, lane markings are often really screwy. As a human, you can typically tell without much trouble where you’re supposed to go, but the version 1 hardware we have for Autopilot on our Model S 85D often wants to track the original, now-wrong road markings and drive into something hard. There’s a reason Tesla says the technology is still in beta and it’s the driver’s responsibility to not crash the car. Take that seriously. In situations with roadwork, I highly recommend you just take over the car right away and turn Autopilot back on once you’re on roads with normal lane markings again. ← As one of our readers noted in a comment under my fist “life with Autopilot” article, the system also acts funny when it gets close to the top of a hill. For a brief moment, it reads the lane marking like it’s going into a sharp turn. It’s super awkward but just lasts for a brief moment and is then back on track. I’m not sure if this provides any real threat, but it’s quite nerve-racking when the steering wheel jerks sideways all of a sudden. ← One final (for now?) instance where I recently found out you really have to be careful is an obvious one but one where I tried to use Autopilot anyway. It was a two-way road with no center lane. It was actually a really nicely paved road with clear markings on each side, but it was such a narrow road that it didn’t have a center lane. I turned on Autopilot and the car wanted to drive right in the middle of the asphalt. It was a good thing I didn’t turn on Autopilot while a car was nearing from the opposite direction! Needless to say, I didn’t play with Autopilot on that roadway again unless there were no other cars in sight and I had good vision far ahead of me. Overall, I’d say that Autopilot is a big plus and adds a lot of safety if used correctly. But, yes, you’ve gotta pay attention, you’ve gotta be ready to take the wheel, and you’ve gotta drive carefully. *To be honest, I didn’t drive much before co-founding Tesla Shuttle, so rather than experiencing an ease in stress and responsibility from Autopilot, my life got busier just from having to sit behind the wheel more than once every few months.